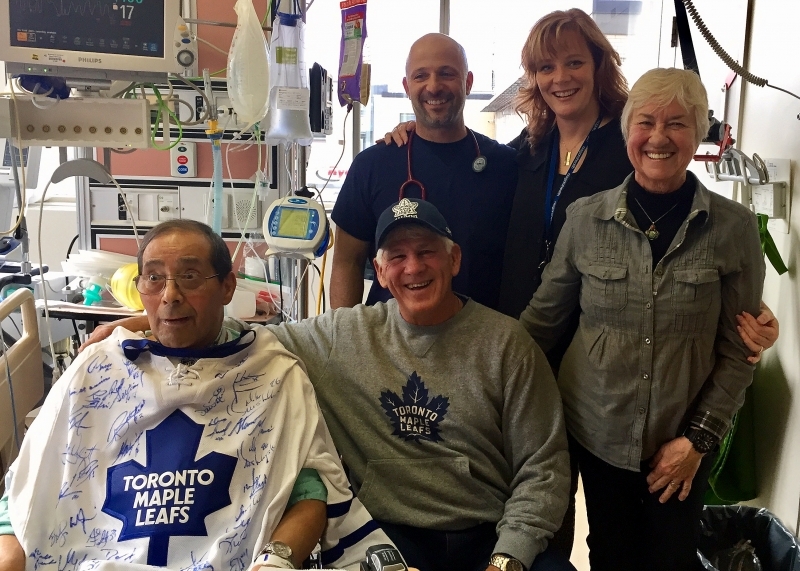 It’s no secret in the Intensive Care Unit at our Greater Niagara General Site in Niagara Falls that patient Wayne Fyfe is a big Toronto Maple Leafs fan. Wayne loves watching Maple Leafs highlights and his bedspread is adorned with the NHL team’s logo. Knowing all this, ICU Manager Jen Law decided she wanted to do something special for Wayne and his family. So she called the Toronto Maple Leafs Alumni association to see if a former player would be available to visit Wayne in hospital. And they quickly responded, telling her that Rick Vaive, the Maple Leafs captain in the 1980s, would come visit Wayne on Wednesday. Rick brought Wayne a Maple Leafs jersey signed by former players, and he told Wayne and his family a lot of great stories about his playing days – much to the delight of everyone. Wayne’s wife, Patty, was excited about the visit and thankful to Jen and the rest of the ICU team for making it happen. The visit by the former NHL player was also very special for Wayne’s son, Dave. Rick, who played in the NHL from 1979 to 1991, says it was a rewarding experience to visit with Wayne and his family. “It makes me feel good that I was able to make someone happy,” he says. Jen described the visit as amazing. 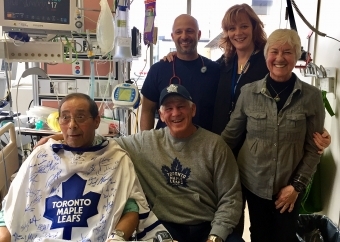 Photo caption: Wayne Fyfe is shown with former Toronto Maple Leafs captain Rick Vaive, Niagara Health Respiratory Therapist Pete Morrone, ICU Manager Jen Law and Wayne's wife, Patty.